Following a tough year for animal protein companies, Kraft Foods returns to the No. 1 position on our annual list of the 100 largest food and beverage processors in the U.S. and Canada. Read about the Top 100. Access processor profiles 1-25. Access processor profiles 26-50. Access processor profiles 51-100. To access the Top 100 chart (a 2-page PDF) that lists our Top 100 companies and compares their 2005 and 2004 sales and income figures, click the link in the related content box or the download link at the end of this article. 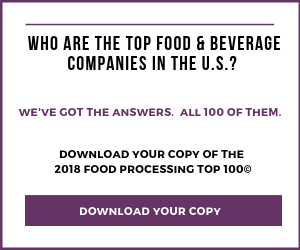 There's a new leader atop our Food Processing Top 100©, although neither of the top two companies turned in a stellar performance. Kraft Foods Inc. recorded a small drop in its North American sales in 2006, but nothing compared to the $545 million sales decrease experienced by Tyson Foods Inc. Those factors combined to return Kraft to the No. 1 position, the spot it held for 30 years of our annual Top 100© ranking (until the 2005 report). Overall and globally, Kraft grew by $243 million (just under 1 percent) for a worldwide total of $34.356 billion. But in the figures we count, sales of only those goods produced in the U.S. and Canada, the Northfield, Ill.-based multinational slipped by $175 million, coming in at $23.118 billion. But 2007 is shaping up to be a good year for Kraft. Chairman/CEO Irene Rosenfeld has been on the job just over a year and the company became fully independent on March 30 following its spinoff from Altria Group. In the first quarter of this year, sales were up 6 percent and profits up nearly 1 percent. The stock price climbed 25 percent in the 52 weeks ending July 19 -- although partly because a number of speculators have been buying significant stakes. Tyson, which the past two years narrowly held our title of largest U.S. and Canadian food processor, saw sales drop 2 percent in the fiscal year that ended Sept. 30, 2006. The Springdale, Ark.-based company suffered its first net loss since 1994. "The best thing I can say about fiscal 2006 is it's over," Richard Bond, first-year CEO, said in a year-end financial report. Bond explains the year in Tyson's annual report: "A convergence of events caused a situation we'd never seen. I'll start with chicken. Hurricane Katrina severely damaged ports, and avian influenza hit Asia. The ability to ship dark meat chicken and international demand for it were affected, causing prices to drop significantly. At the same time, the beef industry was suffering. Major export markets remained closed as a result of 2003 BSE-related bans on U.S. beef imports. Also, tight cattle supplies led to higher live cattle prices and lower utilization rates of our facilities. Because of the oversupply of competing proteins, boxed beef sales prices were not high enough to offset the increased costs. You can't make money when that happens." It was a tough year for all animal protein companies. The year 2006 saw the merger of two large but struggling poultry companies (Pilgrim's Pride and Gold Kist), forming what they claim is the world's largest poultry company in terms of production, displacing Tyson Foods, and the third-largest U.S. animal protein company by revenue. Other meat and poultry firms had similarly disappointing returns, and 2006 saw ConAgra's exit from that category. Swift & Co., barely back in black ink in 2006, just fell under Brazilian ownership. However, it was a difficult year for more than just suppliers of animal protein. Nine of our Top 100 companies suffered net losses for that fiscal year, up from six in 2005. And only 64 of the companies reported sales increases; 20 saw declines. With the exception of Kraft, Tyson and also Dean Foods, seven of our top 10 companies saw sales increase in their most recent fiscal years. Seven of the 10 also improved profits (Smithfield profits were down a tiny bit). Pepsico, still our No. 3 company, increased sales by nearly a billion dollars and, perhaps more importantly, net income was up nearly 12 percent. Facing tough commodity costs and nearly flat milk consumption, Dean Foods saw overall sales drop by $400 million, but most of that was due to the sale of its Iberian (Spanish) holdings. Even with restated figures, sales dipped by $76 million and profits by $84 million. But that hasn't slowed this acquisition-minded consolidator: It bought Friendship Dairies already this year. Kellogg saw a nice 8 percent rise in sales, though less of a bump in profits. Mars Inc., which as a private firm has been very guarded with its figures, claims a $2 billion increase in sales. "We had a very, very good year," explained a source at the company. With no public paperwork, we can't dispute that. While it's far down the list at No. 87, the company now called Butterball LLC nearly quadrupled in sales. That's because its predecessor, Carolina Turkeys (last year's No. 99), took on the huge acquisition of the Butterball organization from ConAgra, as well as some operations thrown in by parents Smithfield Foods and Maxwell Farms. After the accounting guys sort it all out, Butterball will be even bigger next year. Just as far down the list, No. 82 TreeHouse Foods grew by 40 percent. The two-year-old company, created when Dean Foods spun off its non-milk businesses, last year acquired the soup and infant feeding businesses of Del Monte Foods Co. And this May 31, it bought the San Antonio Farms salsa and picante business, as well as several smaller businesses, meaning it should move up the rankings even further next year. Especially after the late-July stock market dip, Christopher Growe, analyst with A.G. Edwards & Sons Inc., St. Louis, views the publicly traded food companies cautiously. While acknowledging "an improved earnings growth profile in 2007 for the group (up an estimated 5 percent) and one characterized by improving margins," he also warns, "Cost inflation is rearing its ugly head again and generating some uncertainty for the remainder of the year." Growe perhaps framed the critical question for this group for the rest of this year, and one which will paint much of our Top 100 portrait next year: "Will the food group be successful in passing along price increases?" Tune in next year to see. Download the Top 100 chart.